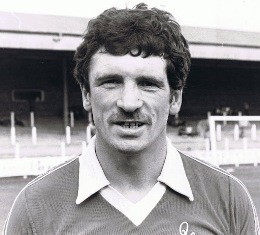 George Cloy gave Queen of the South service that spanned 12 seasons. A massively enthusiastic utility player with a truly boundless love of football, Cloy played 334 first team games for the Doonhamers. A ‘sleeves up and get on with it’ type of player that every club needs, George Cloy regarded it simply as a privilege to be able to cross the white line on to a football pitch, regardless of the occasion. 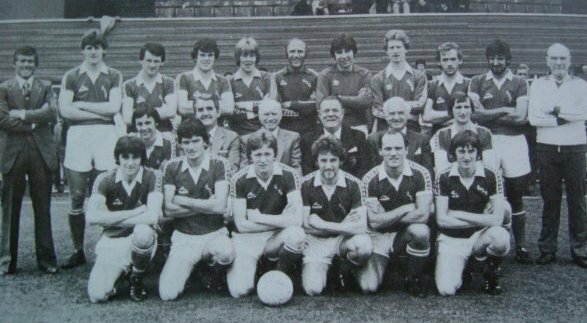 Salt of the earth, happy to let others take the limelight with silky stuff, Cloy’s selfless passion earned him something of a cult status at Palmerston Park. 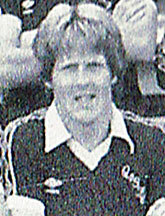 George Cloy eagerly played for Queen of the South in every position on the pitch. On good form, George Cloy contributed to this feature with interviews on 8th and 9th May, 2009. “Oh, it was great, aye,” gushed Cloy. “It was great, aye,” laughed Cloy heartily. “It was aye, we had quite a good team then. Against Dunfermline when we beat Dunfermline 3-1 at home. There was quite a big crowd that day. We beat them at home 3-1. Stewart Cochrane scored, I think it was 2 he got." Kevin Hetherington had scored the Queens opener. Clean sheet to Giro the cat. Giro then added some interesting insight into another player from a by gone age; someone better associated with administering spontaneous on the pitch orthopaedic adjustment. Next Cloy was asked about someone who briefly passed through Palmerston in the 80s with two first team games before playing in England’s top tier and being selected by Ireland for their Italia 90 squad - Bernie Slaven. Brought him out of his shell? Tony Cascarino wrote in his autobiography that when he shared a room with Slaven on international duty, Bernie would phone his dog every night and howl into the phone ’Woof, woof, aru, aru, woof’, kissing the receiver, ’Hello, lovey dovey’ to his dog. "Rowdy ones? Pray do tell." "Ever get to see Queens these days?" “Being involved with the football I don’t, and I’ve got two horses as well.” Cloy enters horses in such events as the Ayr show]. “That’s a shame, you missed yourself there in Denmark.” Especially if you enjoyed yourself with Queens in Portugal George. As Cloy laughed again he was asked to give the run down on where he played after Queens. George Cloy’s time at Palmerston Park covered 12 seasons during which he recovered and came back from a year out with a broken leg. Among his 334 games were 41 goals in his 290 league appearances. He is 18th in the club's all time appearances chart as at 18 September 2017. 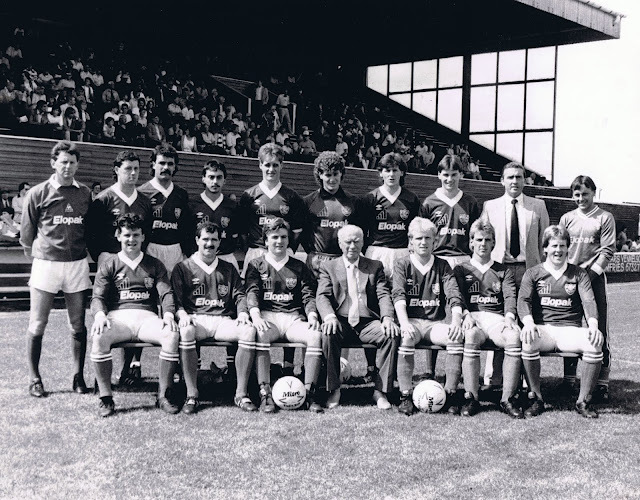 Giro’s commitment to Queens was recognised with a testimonial v Carlisle United in 1989.